If you’ve always admired tightly knit communities where people come together to encourage one another, be sure to stop in at The Next Picture Show in Dixon, Ill. Learn how this nonprofit has evolved into a gathering place like no other. Tecent years have been tough for many organizations, which makes it all the sweeter to celebrate the 10-year milestone of one that’s seeing true success. 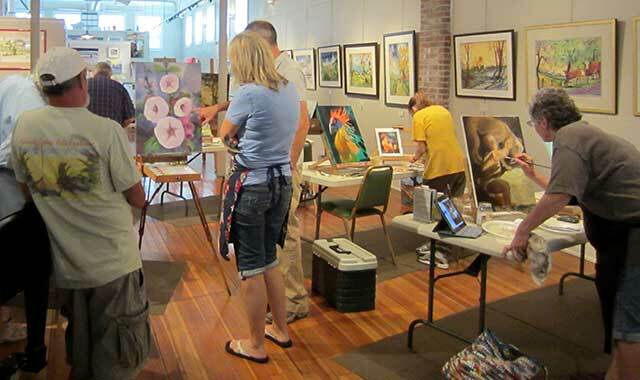 The Next Picture Show (TNPS), a nonprofit fine arts center in downtown Dixon, Ill., began as a place to celebrate and encourage art and artists. Today, it’s all that and more. It has evolved into a central hub for Dixon, a space where people celebrate not only the arts, but also their own vibrant community. Inside this bright, vintage gallery space, possibilities for the future seem just a little easier to grasp. Although ultra-dedicated Kime is the gallery’s only paid staff member (she kids about asking her board of directors to install a shower and bed for her), the gallery keeps 8 a.m. to 4 p.m. business hours Tuesday through Sunday, and stages endless events outside of those hours, thanks to a devoted board of directors and a robust pool of volunteers. TNPS’s mission is to teach, study, show, celebrate and create art, “and our volunteers are as passionate as I am about our purpose,” says Kime. Along with weekly duties, they show up for all-day sessions of art hanging, when juried shows and other exhibits rotate. The gallery displays and sells the work of artists from across the Midwest, in themed shows such as River Reflections, Farms & Barns, and Architecture & More. In May, TNPS will host the Illinois Watercolor National Exhibit, and, in November, a very choice 30-piece traveling exhibit of the National Watercolor Society. The crowded 2014 schedule of events at TNPS reveals just how adept Kime is at forging partnerships throughout the community, not only with school districts and public entities, but also the private sector. For example, as part of the gallery’s 10th anniversary commemoration, TNPS is teaming up with the John Deere company and Sauk Valley Bank, which celebrates its 15th anniversary this year. The Next Picture Show will host a special John Deere Exhibit at the gallery for the month of August, which will depict the history of John Deere through artwork by Walter Haskell Hinton. On Aug. 9 and 10, the street in front of the gallery will be lined with John Deere Green. There will be an Art Walk in Grand Detour at the John Deere Historic Site on Aug. 17. This precedes the 66th Annual Grand Detour Arts Festival in September at the Deere site; TNPS hosts the Student Art Works for this festival. “I’m an opportunist,” says Kime, who has a knack for connecting people. One example: Illustrator Douglas Kitto relocated from Chicago to Dixon, in part because of the city’s thriving arts community. When Kime heard that All Safe Storage & UPS was looking to paint something on the huge overhead door of its Timber Creek Drive facility, in Dixon, Kime enticed Kitto to sign on for a mural. “The owners wanted people to have something nice to look at on their building,” Kime says. “The result was spectacular – a tribute to Dixon’s history.” The mural depicts the Rock River, Ronald Reagan and his boyhood home, the Dixon Arch and Lowell Park. The gallery is currently exhibiting Regional Survey of Art 10, sponsored by KSB Hospital. The months of February and March will feature themes of Black History, Prospectives, Art and Photography and work by an autistic artist. Throughout its anniversary, local musicians will perform at TNPS, many of them old friends of the gallery, like Corky Siegel & Bonnie Koloc. In September, TNPS will organize Art on the Square, which was discontinued in 2006. “Artists of all ages will be invited to paint 170 to 180 squares [cubes] with acrylic-type paints, and we’ll display them throughout the city after the Petunia Festival,” says Kime. The event is sponsored by Midland States Bank. As part of its 10th anniversary celebration, TNPS will host a Cake Pour on Feb. 8, in which frosting becomes the medium for abstract design. “We want everyone to stop by and see the edible art and enjoy,” says Kime. The nearly 8,000-square-foot space The Next Picture Show inhabits is, in itself, beautiful. Built in 1854, seven years before the Civil War, it has original wood floors, tin ceilings and airy, bright spaces. It was completely renovated in 2003, by local philanthropist Ralph Edgar. Edgar supplied partial operating funds for the first three years of the organization, as it got on its feet. Today, TNPS pays rent to Edgar and is self-supported through donations, rental fees and fundraisers. And for the first time, the City of Dixon has awarded the organization a $10,000 grant. Contributing to the community’s enthusiasm for this art enclave is a growing hunger for original art, and rising disdain for its counterpart. “In general, society is growing tired of all things mass-produced,” says Kime. That trend works to her advantage, and she delights in bringing people together to create something they couldn’t achieve alone. This entry was posted on Friday, February 14th, 2014 at 11:58 am	and is filed under Features, Top Posts. You can follow any responses to this entry through the RSS 2.0 feed. Both comments and pings are currently closed.